Decorate old fashioned clothespins with poms, foam sheets, paint and other craft materials to create whimsical wintertime friends! 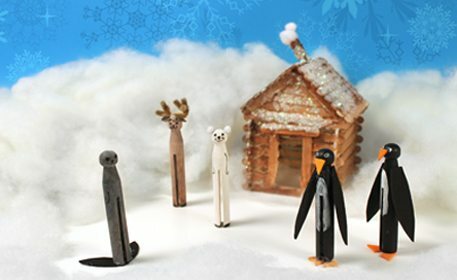 For the reindeer, paint the clothespin white and brown with Acrylic Paint. Use black Acrylic Paint to paint on a face and hooves. Cut a fuzzy stick so that you have (2) pieces that each measure 1 1/2 inches. Twist into antlers. Glue on the antlers and then finish with a tiny brown pom on the top of the head and a second one as a tail. For the polar bear, paint the body white with Acrylic Paint. Paint on a face and paws with black Acrylic Paint. Glue (2) tiny white poms to the head as ears and (1) the the back of the polar bear as a tail. For the penguins, paint the body black and the belly white with Acrylic Paint. Paint (2) white circles for the eyes and then place a dab of black paint in the center of each eye. For the beaks and the flippers, cut out orange foam sheet shapes and glue to secure. For the seal, paint the body with grey paint. Add flippers at the sides and facial details with black Acrylic Paint. Finish the seal by cutting out flippers out of black foam sheet and glue to the bottom of the clothespin.